The Great Wall of China is a series of fortifications made in the general east-west direction in Northern China to protect the Chinese empire from encroachment by nomads, invaders and any other intrusion. It is made out of bricks, wood, earth stones, tamped etc. The wall was first built in the seventh century BC. However, the most significant piece was built in 220–206 BC by the first Emperor of China, Qin Shi Huang. In different eras, the wall was built and maintained. 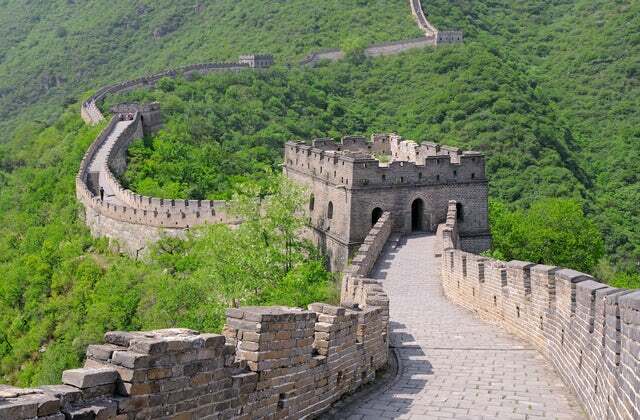 The wall as we see it today was constructed by Ming Dynasty. Other additional interesting facts of the wall are as follows. 1. Most people label the Great Wall of China as one of the seven wonders of the ancient world. They are wrong. It is one of the seven wonders of medieval world. 2. The Great Wall of China is not a continuous wall made in one reign. Rather, it is sections made by different Chinese Dynasties. 3. The wall is 22000 kilometers (13670 miles) long if you put into account all the different sections of the wall. It is also 25 feet tall and 15-30 feet wide, such that two cars can pass each other on the wall's lane. 4. The Ming Dynasty was the most important rebuilder of the walls. They made it complete with watch towers and battlements and cannons to better protect their subjects from their enemies. 5. The United Nations Educational, Scientific and Cultural Organization (UNESCO) in 1987 listed The Great Wall of China as one of the World Heritage Sites. 6. The Wall has been built by more than 1 million people. Unfortunately, it is also referred to as the greatest cemetery on earth, killing over 1 million people who were involved in building it. 7. There are Rumors that Astronauts can see the great wall from space with naked eye. These rumors are untrue. It can only be seen with space magnifying instruments. 8. The rumor mill is also rife with the fact that the mortar used to join the bricks was human bone. The mortar was actually made from rice flour—and no bones were used, human or otherwise. 9. The wall is a personification of the Chinese Dragon. The Chinese believe that the Dragon in spring give life to the earth. 10. The Wall has seen more batters than any other place on earth. In fact, bullet holes from its last war, the Sino-Japanese war of 1938, are still visible on the Wall at Gubeikou. The Great Wall of China is a significant world monument and there are hundreds of interesting facts about it. This article is just an attempt to scratch at the surface. If you want more, you will have to do a more thorough research.